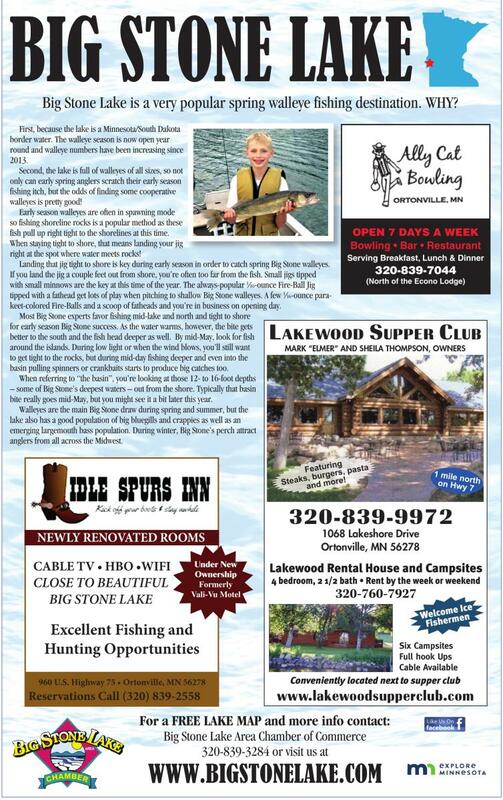 Big Stone Lake is a very popular spring walleye fishing destination. WHY? First, because the lake is a Minnesota/South Dakota border water. The walleye season is now open year round and walleye numbers have been increasing since 2013. Second, the lake is full of walleyes of all sizes, so not only can early spring anglers scratch their early season fishing itch, but the odds of finding some cooperative walleyes is pretty good! Early season walleyes are often in spawning mode so fishing shoreline rocks is a popular method as these fish pull up right tight to the shorelines at this time. When staying tight to shore, that means landing your jig right at the spot where water meets rocks! Landing that jig tight to shore is key during early season in order to catch spring Big Stone walleyes. ⁄16-ounce parakeet-colored Fire-Balls and a scoop of fatheads and you’re in business on opening day. Most Big Stone experts favor fishing mid-lake and north and tight to shore for early season Big Stone success. As the water warms, however, the bite gets better to the south and the fish head deeper as well. By mid-May, look for fish around the islands. During low light or when the wind blows, you’ll still want to get tight to the rocks, but during mid-day fishing deeper and even into the basin pulling spinners or crankbaits starts to produce big catches too. When referring to “the basin”, you’re looking at those 12- to 16-foot depths – some of Big Stone’s deepest waters – out from the shore. Typically that basin bite really goes mid-May, but you might see it a bit later this year. Walleyes are the main Big Stone draw during spring and summer, but the lake also has a good population of big bluegills and crappies as well as an emerging largemouth bass population. During winter, Big Stone’s perch attract anglers from all across the Midwest.